What responsibility do we have towards our fellow man? Masonry teaches that each of us is “our brother’s keeper” and that mankind consists of a Universal Brotherhood. When safe and secure, we may be quick to argue that we would go out of our way to save our friend, brother, or neighbor. What would happen, however, if you were forced to choose between saving your own life versus protecting the life of another? Touching the Void, a book written by Mountaineer Joe Simpson, tells the harrowing true story of two men trapped on a mountain faced with such a life and death situation. 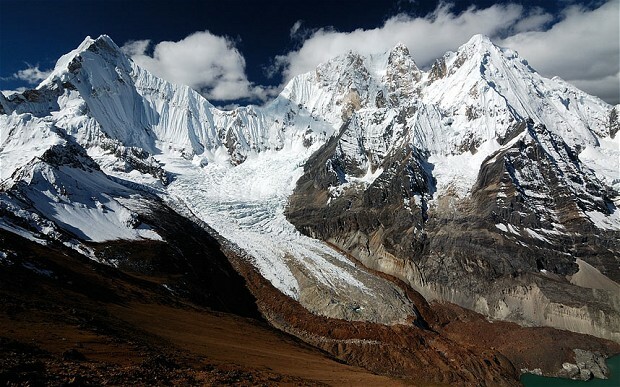 Despite perilous conditions, Yates and Simpson became such “dreamers of the day,” making their dream a reality by ascending the Siula Grande’s 4,500-foot west face in three days. Their celebration was short lived, however, as disaster struck during the treacherous descent of the peak. Whiteout conditions enveloped the climbers eventually leading to Simpson slipping down an ice cliff and breaking his leg, crushing his tibia into his knee joint. The team’s ambitious ascent had depleted their supplies, and they no longer had fuel for heating, cooking, or melting snow for drinking water. With daylight fading and Simpson in critical condition due to this injury, the pair had no option but to attempt a fast and tricky descent of 3,000 feet back to base camp. With his right leg shattered, Simpson relied on his climbing partner to methodically lower him down the mountain 300 feet at a time via two knotted ropes. Simon Yates reflected on his burdensome new responsibility, “I knew I couldn’t leave him while he was still fighting for it.” Hour after hour, Simpson and Yates made painstakingly slow progress down the mountain. Eventually, a blizzard surrounded the climbers bringing chaos and destroying communication between the pair. In the confusion, Yates mistakenly lowered Simpson over the edge of a cliff. Dangling eighty feet above a crevasse, the injured and exhausted Simpson was unable to climb back to safety with his frost-bitten fingers. 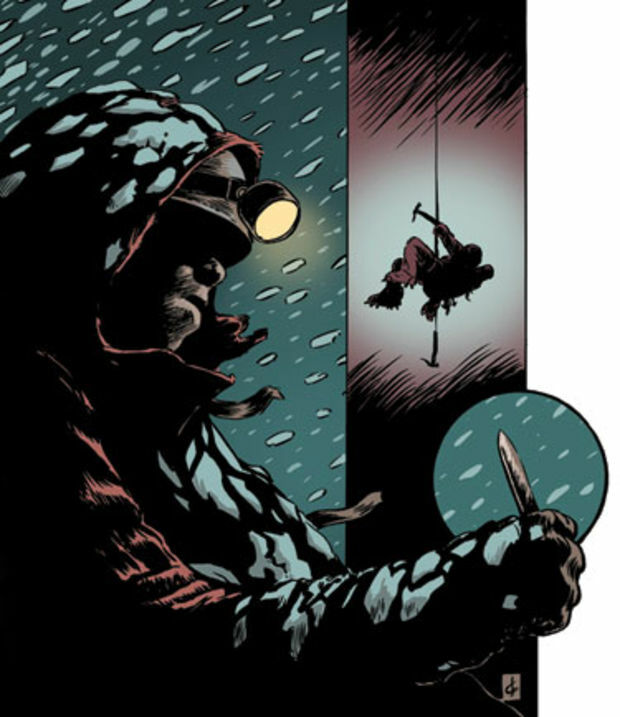 Swallowed by the blizzard, Yates was essentially blind to his partner’s situation. Because of the weight on rope, he knew Simpson was suspended over some kind of cliff, but he was unable to see or communicate with his partner. He also was unable to pull Simpson back up to safety. Through sheer willpower, Yates kept his footing on the icy slope for over an hour protecting both from plummeting into the void. His strength failing, Yates faced the moral dilemma of his life: should he save himself by cutting the rope and send Simpson to almost certain death? 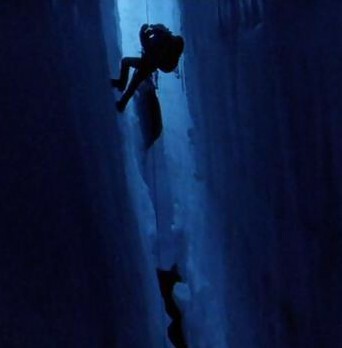 As his snow anchor began to collapse, Yates cut the rope and Simpson’s body plummeted down the cliff and into a crevasse: a deep fissure in a mountain glacier. When Simon Yates descended to the ice cavern, he called out to Simpson but received no response. Assuming his partner was killed in the fall, Yates made his way back to base camp. Miraculously, Simpson survived the 150 foot fall, landing on an ice shelf inside the crevasse. When Simpson regained consciousness, he discovered the cut rope end and realized what his partner had done. If he wanted to live, Simpson knew he had to save hims elf. Repelling further into the dark ice cave, Simpson discovered a small opening in the ice and climbed out of the glacier, emerging like Lazarus from his tomb. Forced to crawl due to his injuries, Simpson tenaciously began a three day crawl back to base camp. Exhausted and fighting delirium, he reached base camp only a few hours before Yates was set to leave. Arriving at camp, Yates and another climber treated Simpson’s injuries, and the three men then traveled back to civilization. Many climbing experts argue that, paradoxically, it was Simon Yates selfish decision to cut the rope and save his own life that also saved his climbing partner, Joe Simpson. Even if Yates could have held him aloft for many more hours, many argue that Simpson would have died from exposure to the elements. Simpson, while understanding his partner’s decision, writes in Touching the Void about his initial hope that he was still connect to Yates: “Did he fall with me? Find out… pull the rope! I tugged on the loose rope. It moved easily…. I pulled again and soft snow flurried on to me. I pulled steadily, and as I did so I became excited. This was a chance to escape.” Based on Simpson’s position after the fall, there was more than a chanc e that Yates would have also lived, either landing on the ledge or being held aloft by the rope tethered to Simpson. Realizing that his partner had left him to perish, Simpson was filled with despair and faced with the improbable odds of returning to base camp alone. When an individual acts against their own self-interest, should we let that person fall, metaphorically speaking, in order that they can develop the strength and wisdom to rescue themselves? The institution of Freemasonry exists as an exception to modern society’s tendency to severe ties and abdicate responsibility towards those who are struggling in a state of darkness. As a brotherhood comprised of men and women, senior Masons with experience and knowledge lend a helping hand to those who may lack the guidance and support necessary to change themselves. As freemasons, we are obligated to help our fellows, regardless of their background or station in life. Interestingly, the word “obligation” is derived from the same Latin root as “ligament.” A cord by which one thing is tied to another, a ligament is not dissimilar to the very rope which held Simpson above the precipice. Bound by oath, Masons stand firm as protectors of humanity refusing to sever the tie that binds regardless of the consequence.